Thanks for all your comments on my purple coat! I love it so far and have worn it a few times. I feel a little self-conscious about all the second takes I am getting in that coat! But I feel rich and great in it, except that the wool is a little scratchy, even through the lining! Hopefully it will be better after a few wears. you cant complain about a $6/yard wool that has such a gorgeous color! I dont think I have ever shown you my sewing room here! We bought a house back in the 2008, and I was so happy to be able to have a room just for sewing, and not having to annoy my back-then-boyfriend with all the needles on the ground, fabric pieces everywhere, and my old sewing machine causing a series of unstoppable earthquakes on the desk we shared. I thought it was awesome, but looking back, it is kind of sad and droopy. Since then we had changed our windows to dual panel, hence lowered it to meet city code (and to allow me the shortie to see outside without tiptoeing). I planted a peach tree outside the window for privacy, as the room looks into our neighbor’s room. 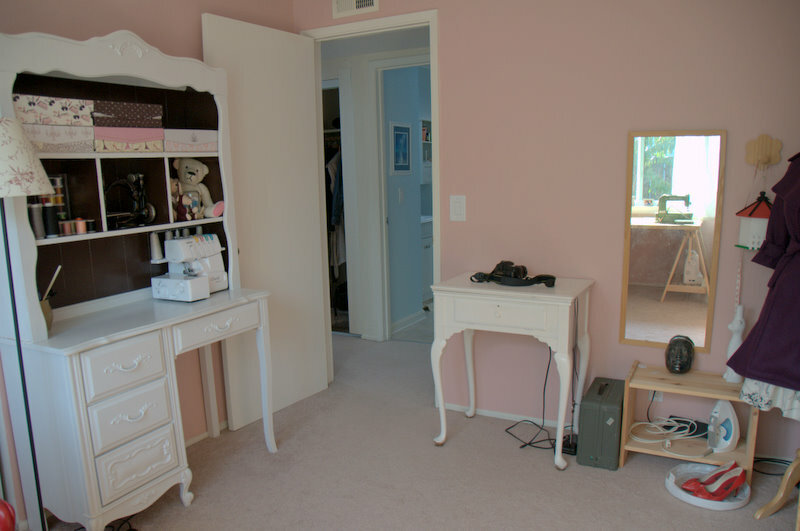 I also decided to go all out and painted the room pink. Yes! Pink! I am not a pink girl, but I love a good clique and the result wasnt half bad. I have also acquired a few piece of furniture from craigslist for pretty cheap/free since then. Now, I think my sewing room is pretty much complete! Left wall: row of magazine holder to hold all those bulky patterns, books, and burda magazines. zigzag bookshelf I made to hold smaller patterns — it works really well! center: ikea bookshelf from craigslist to hold all those fabric in my stash! center right: my sewing table! It can be moved out easily to suit my mood, and the bottom legs fits my two sewing machines perfectly. note how huge my peach tree has gotten in just 2 years! It flowered pretty pink flowers this year and produced tons of delicious fruits. I think its because I always stare at it and occasionally talk to it. Left: My most recent acquisition from craigslist, for only 60 dollars, is a cute desk with a cute hutch. It is now my serger and notion station, and probably my favorite piece of furniture in the house! The notions are stored in series of boxes with sewing/fashion theme to it, to be fitting to the room, one of the shelves is perfect for my Wilcobb & Gibb sewing machine. right: self-admiring station and a dressform! center: I dont think you can be a real seamstress without a cute cat. This one loves to agitate me when I am cutting out fabric by constantly trying to get under them. She may look cute, but she is one feisty kitty and I love her that way. I now love my sewing room! Do you have a space for just sewing? I would love to see them! Feel free to comment with a link to your blog entry/photos! This entry was posted on Tuesday, October 19th, 2010 at 11:38 pm	and posted in hardware, house to home, sewing. You can follow any responses to this entry through the RSS 2.0 feed. I love, love, love your sewing room! And now I really want to plant a peach tree. It looks great. I love the desk, what a beautiful piece of furniture. And a peach tree outside, how wonderful is that? I don’t think peach would grow here, but I would love to plant one if I could. I think the pink looks really warm and cozy. I love it! Sophie’s coloring even matches your room: pink nose and ears, white fur with a few light brown patches. Did you buy the furniture/paint the room to match her??? teehee! no, i actually dyed sophie’s fur to match MY sewing room! What a cute sewing world you created for your self! After reading your post, I am now very motivated to restructure my “sewing” room into My Sewing Room. Oo la la! My husband is going to hate this! I will not mention your name, promise. I love colorful rooms,thats inspiring. I have just a corner, with two bookshelves and a little desk, but sometimes i use my office desk. Next year, i move in another city and hopefully rent a major apartment with a sewingroom. i love that little corner! I am a sucker for that kind of windows 🙂 i think a sewing corner is great too, it makes you be super efficient with your space and be compact about your stuff. when it comes down to it, you really only need a few stuff for sewing! 🙂 but! i cant want to see your new sewing room! What a cute room! Hehe.. I currently share an office with the hubs (which I’ve pretty much taken over), and I totally know what you mean about the earthquake. You are so lucky to have your own sewing room. My sewing space is in 20m2 living room which is full of other stuff – sofa, tv, computer desk, whick is also sewing desk. 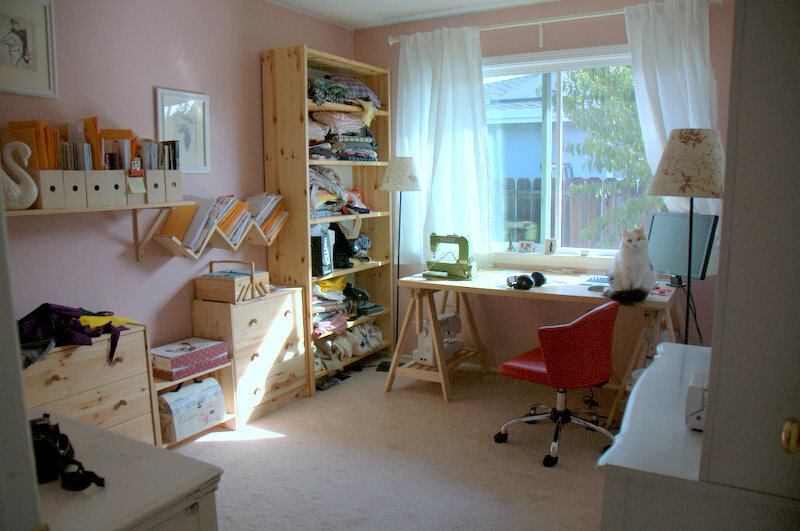 It is my dream to have a my sewing room some day. Im glad you like them!!! I was so proud of them when i made it. They are simply just square pieces screwed into eachother, however, i do recommend using a L bracket to hold them together instead, as that would be much much stronger.